Your smile can change your entire appearance, gaps in our teeth can make us feel self-conscious and may affect our personal and professional life. Some of the treatment options at Kissing Point Dental for gaps and spaces are. Laminates made of white composite resin that change the appearance, shape and colour of your teeth. A series of crowns that use the tooth either side to anchor a fake tooth. Porcelain veneers have successfully improved smiles by making dark teeth look lighter and healthier looking. They can make yellow teeth permanently whiter and gray tetracycline stained teeth look much more natural. Porcelain veneers can make crooked teeth look straight in just a few days. Patient’s can look and feel more confident, more professional and have a wonderfully natural looking smile. A crown is a laboratory made restoration that covers all or the majority of an exposed tooth. Crowns provide additional strength to teeth and are often the best way to save teeth. In addition they can also be used to alter the shape, or colour or orientation of teeth. A crown can be made of metal [usually gold], porcelain or porcelain veneered to the metal. Today there also new cutting edge technologies allowing us to fabricate crowns in “white gold” made from materials such as Alumina and Zirconium. These materials are similar to porcelain in appearance but are significantly stronger. Gold alloys are used for their strength, hardness and durability and are still very often recommended for use on especially 2nd molar teeth which generally have little aesthetic value but need to withstand the most extreme grinding an crushing forces. 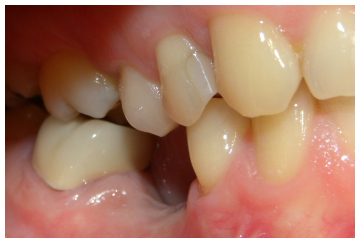 All porcelain restorations are strong and can be made to match the shade of the surrounding natural teeth. The smooth surface of the porcelain makes it resistant to staining. The superior aesthetics and improved strength of the modern day ceramics make all porcelain crowns the natural choice for front teeth crowns in most circumstances. Once the tooth is appropriately shaped an impression is made. This impression is sent to the dental laboratory where the technician will make a model that is an exact replica of the tooth in the mouth. It is on this model that the technician will fabricate the new crown. During the period of manufacture you will have a temporary crown fitted to the tooth. At the fitting appointment the temporary crown is removed and the after checking for accuracy of fit, colour and relationship to the adjacent and opposing teeth, the permanent crown is glued or bonded into place.